Friday May 19 1911 I got home on the first car. I did not sleep much last night. Will helped me do a big washing by ten oclock. There was a strong hot wind. I got Mrs Jones electric iron and did all the ironing before bed time. Saturday May 20 1911 Will went to town today. The folks got here last night in a rain storm. I worked all day in the front [part?] of the house cleaning wood-work and putting up [curtains?]. Went down home at 7.15 to to see the folks and sleep with Mother. The baby is so sweet. Ott Fannie Hattie and I had a talk over Mothers condition after she had gone to bed. Sunday May 21 1911 I came home on first car. Harry and Nellie came for a call in forenoon. We had hard shower. I got dinner over and slept three hours. I read in evening. 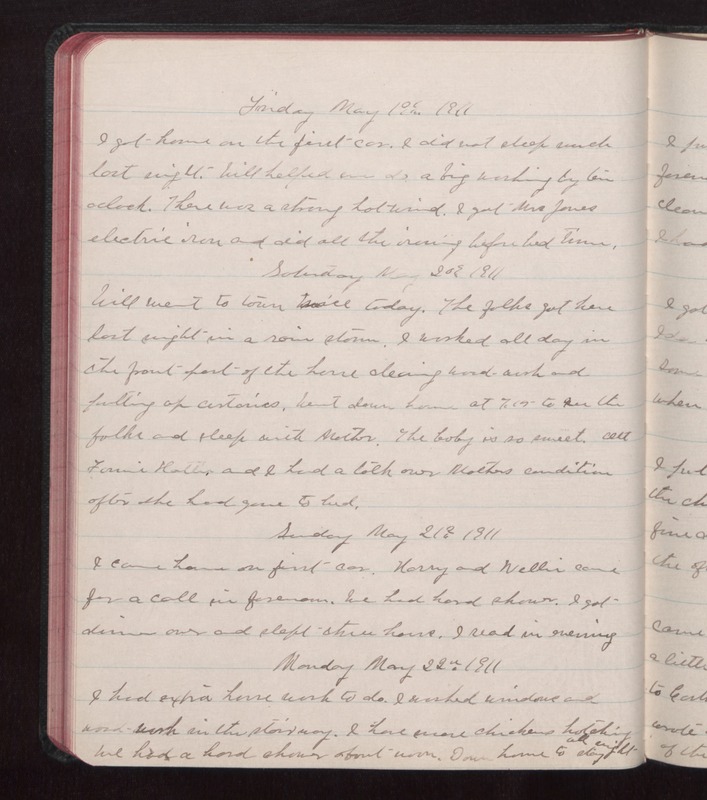 Monday May 22 1911 I had extra house work to do. I washed windows and wood-work in the stairway. I have more chickens hatching We had a hard shower about noon. Down home to stay all night.